David attended The Barbara Speke's stage school in London from the age of 9 years old, from where he was selected to appear on many television shows. You may remember him as the 'Persil Kid' in the 70's and the star of Junior Showtime. Every week you could watch David singing, dancing, acting and presenting the prizes on one of the biggest game shows "3-2-1" of the late 1970's and 1980's, hosted by the popular Ted Rogers. In later life, David has also appeared on Coronation Street, Emmerdale, Brookside and Juliet Bravo. He has also fronted over thirty television commercials and been involved in numerous feature films; including Glory Boys and Dracula. He has had starring roles and acted alongside many world famous actors including Rod Steiger, Anthony Perkins, Brian Conley, Ben Elton and The Young Ones Team, Dame Helen Mirren, Dennis Waterman, Lenny Henry CBE, Dawn French, Richard Wilson OBE and many, many more. David was heavily involved helping various police forces nationwide with the Crimewatch Program and featured in the reconstructions due to his previous acting experience. David was picked for this role due to the serious nature of program and acting involved and is very proud of his lasting involvement in this show throughout the 1980's and 1990's. In the early 1970's David started The Dave John B Disco Roadshow and interactive show with live cabaret acts. The disco roadshow has proven hugely popular and has performed for many stars including, Bucks Fizz, The Nolan's, Cannon and Ball, Stu Francis, Mick Miller, Manchester City Football Club, Liverpool Football Club, Newcastle United Football Club, Kenny Dalgleish, the A1 pop group, The Lighthouse Family and also BBC and ITV end of production shows. David was also involved presenting the parties at Blackpool end of season shows for the stars. Dave John B has also presented live various outside broadcasts for radio stations including Manx Radio, The Bay and Red Rose Radio. The Dave John B Disco Roadshow show also opened up Euro 96, the european football competition in front of over 16,000 people at St James Park, the home of Newcastle United Football Club. Over the last two years the Dave John B Disco roadshow has gone from strength to strength and has been performing at the Ricoh Arena in Coventry catering for over 1500 people per night. The show has also had the honour of being re-booked time and time again by the United Kingdom Snooker Open Championships. Knockout Roadshow was established in 1984 when David first started. David has been part of the show for the whole duration whilst the company changed names twice. The show was originally Knockout Roadshow then became Knockout 2000. When David bought into the Knockout brand it was changed back to the original name of Knockout Roadshow. A recognised and established expert in the world of entertainment, Dave John B brings a huge range of experience and expertise to his promotions, supported by qualified employees and huge investment in stage shows, costumes, equipment, music and lighting. David has also hosted and compered various balls and events throughout the United Kingdom and recently worked as a presenter behind the scenes interviewing contestants on the X factor prior to their live auditions. 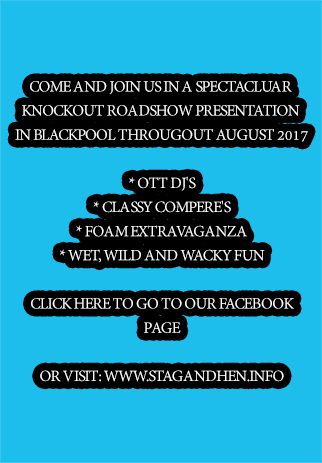 The Dave John B Disco Roadshow and Knockout Entertainment - Simply The Best.